The content of this topic has been archived between 23 Oct 2016 and 24 Apr 2018. Unfortunately there are posts – most likely complete pages – missing. 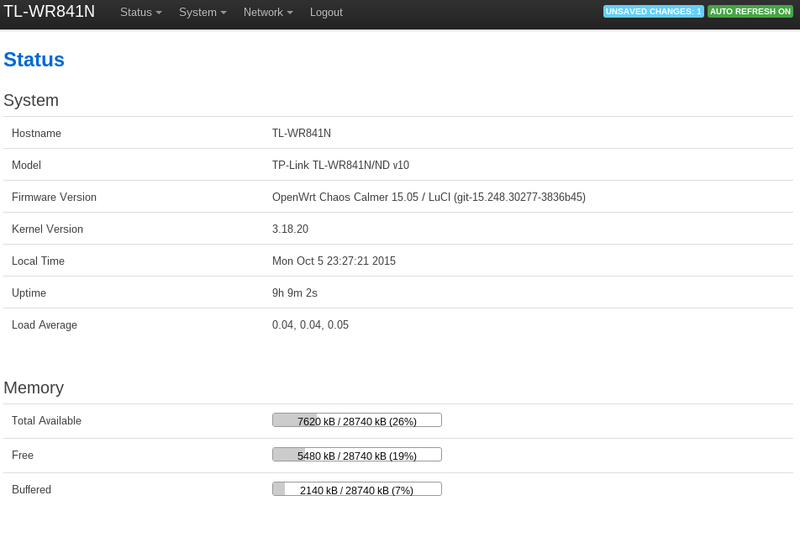 Hey I was able to install OpenWRT on the TP-Link TL-WR841N v10 by using the v9 firmware only and without using Serial Console. Do a factory reset after taking a look at your current settings . Browse to the downloaded file and upload. PS: I will upload a DD-WRT too but someone needs to test it as I couldnt find time to test it on my friend's router. So anyone who is interested can pm me. or you did something to the header. I edited the header of the file and just to remove the confusion i renamed the bin file thats all . So the forumers will have use the provided file . Hi, V9 Works fine when its BIN File Hardware ID Headers are Changed using some Hex Editor from '09' to '10' to support v10 Model. However, Only Internal Antenna works External Antennas do not work refer to the forum thread below in which I have found the way to run v9 Firmware on v10 by changing the Bin File Headers. As I said its a friend's router . I have to check it and yeah a MD5checksum and a header edit enables the v9 firmware to be flashed on the v10 . Even DDWRT works that way but faced a few glitched on DDWRT . 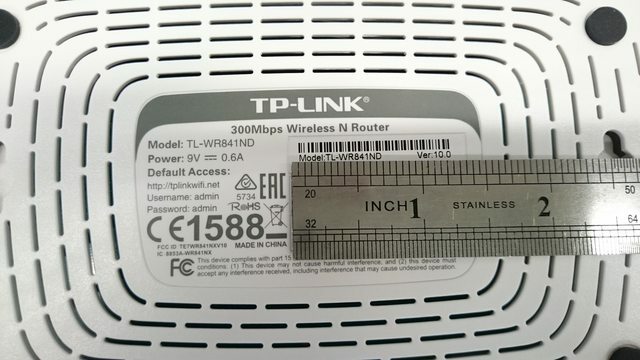 Anyway I didnt check the range on the stock TPLink firmware . Cant comment on the range as of now . But I will try to get back ASAP . And extensive googling didnt bring up your thread so I made this thread to help others but if what you claim is true then its not worth the change . I have about 3 Devices of v9 and 5 Devices of v10 I can fully confirm that External Antennas are not working when OpenWRT is Installed in v10 Device. Well I don't own the router personally but since my friend is interested in openwrt I will try to test on it . But cant give an ETA on it . But I dont have much idea why the external antennas wont work. Are there pictures of case (front + rear), backside label incl. 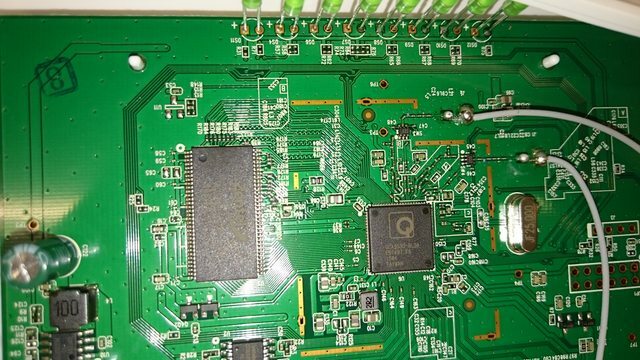 FCC ID, the inside, the SoC, Wireless chip, serial port / JTAG port available? Would come handy on the devicepage http://wiki.openwrt.org/toh/tp-link/tp-link_wr841n_v10, or even better, on the general page of the TL-WR841ND http://wiki.openwrt.org/toh/tp-link/tl-wr841nd. Did anyone open a ticket in the bug tracker system? I could not find any related to v10. Thanks to the unremitting work of Neoraider we now have a patch that fixes the low transmitting power.
! !This version is only for router containing a QCA9533-B3LA CPU!! Once again, thanks to neoraider! It seems that it gets better coverage than before now, thanks. FYI: my firmware has ALL mtd partitions write-unlocked, i.e. you can flash other ART data or even other bootloader by using "mtd write" command. I have a ISP Viettel OEM version v9 with 8 meg flash different from the retail 4M. 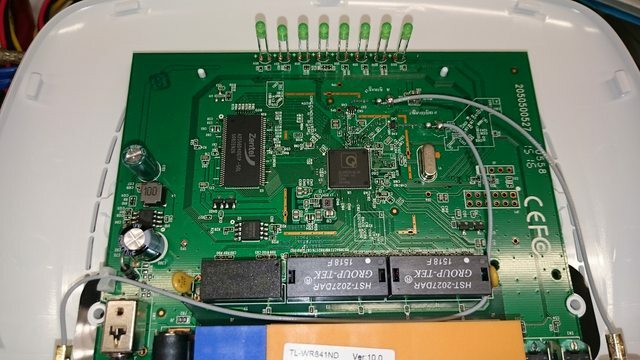 Did you have TR-069 in your reatil firmware and ipv6 too? Tell me how you did it! Still procrastinating setting up the serial cable and having a look see. Not for too much longer though, I've had all the gear to do it for years. and I seems that it gets better coverage than before now, thanks. Thanks for the update and uploading the Build it seems to have resolved the signal strength issue Now Signal Strength is very good.. there is nearly about 3x Increase when Setting Up TX Power to 21 dbm in /etc/config/wireless. Getting Signals on Multiple Floor now from same AP. How to go back to Factory Firmware. Unable to revert back to the factory firmware. tried the stripped version as well. you can always try TFTP method, with filename "wr841nv10_tp_recovery.bin" in your tftp root. I'm interesting to test DD-WRT firmware. Thank you very much roytam1 ! I tried at channel 8 and 19dbi tx power on both devices and it works. thanks mate that worked, i was looking for bandwidth control and other options as well, unfortunately was unable to install those packages. Great work by you all. Will visit back for sure.